(CBS News) Sticking with the theme of jumping and running around like crazy people (crazy, talented that is), these guys take free running and parkour to a whole new level -- a Jedi level to be exact. Shot in a breath-taking desert atmosphere (referred to by these dudes as Mars), Jeremy Carpenter and Sinjin Cooper show off their talents in this "Star Wars"-inspired video posted by free runner aficionado YouTube user poster Ronnie Street Stunts, that is sure to blow your mind -- as well as set it free. Talk about being in shape! And athletic, creative, imaginative, brave, insane, and every other adjective you can think of to describe these guys flipping around the desert in Jedi gear. 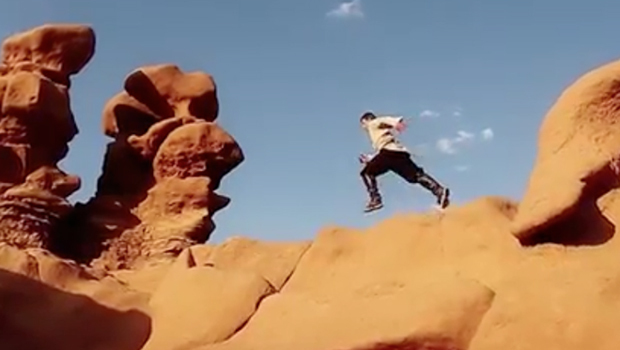 Not only is it hard to simply run around in the desert sand like that, but launching off of rocks and flipping and twisting around seems downright impossible. But it also looks pretty fun. If I were to exercise (which I don't, but this isn't about me), I think I would enjoy parkour, I used to fancy myself the gymnast when I was younger after all (but again, not about me here). Regardless, I hope these guys get to make the sequel touted in the YouTube description, which promises a chase and "epic light saber battle." May the Force be with you both! Also, check out the behind-the-scenes footage by Ronnie Street Stunts, including how and what kind of camera they used to capture all of this amazing footage, below.